Aside from the lovely interior, it features wooden lattice in its facade. Aside from modern homes of today, there are also apartments, condominiums and townhouses where many people opt to rent or buy as a home. Most of these are located in cities and in areas that are near the urban life. But of course, these also have stylish designs and appearances too. The interior of the homes are also given beautiful designs that are comfortable and functional. Today, we are going to feature townhouses that has a unique design which is very impressive and stunning that it sets it apart from other townhouses. 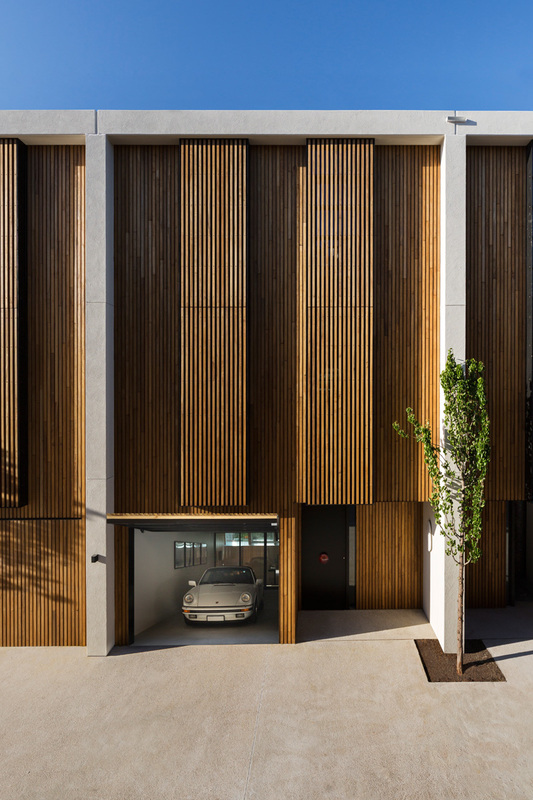 A collection of 24 contemporary townhouses in Brighton are seen in the beachside suburb of Melbourne, Australia called 30 Esplanade. The townhouses are designed by Wood Marsh Architecture giving it a unique facade. 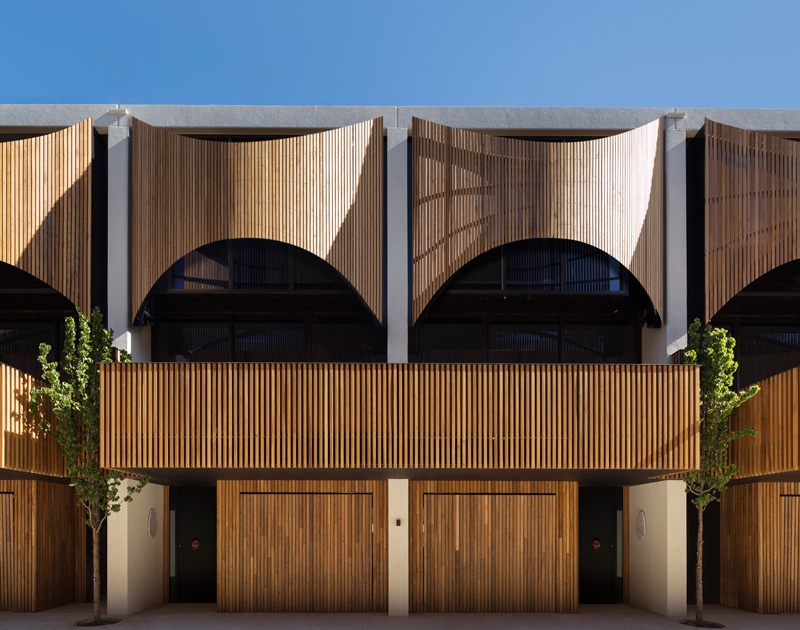 The intention of the designer was to “reinterpret the traditional Victorian terraces that line many of Brighton’s streets and reappropriate this ideal for a contemporary lifestyle.” The building features a strong skin that is naturalized by the timber fringing. The design of the house is a modern take on the typical wrought iron latticework that is commonly seen in period homes. The inspiration of the house is from the neighboring bay giving it the concept of coastal living. It was also “reimagined with a depth of materiality and refinement that challenged conventional interpretations of seaside homes and stereotypical townhouses,” Wood Marsh Director, Randal Marsh said. Let us take a look at the design of the townhouse below. Unique feature: Townhouses may sound classical but these can also appear with a modern or contemporary design just like the 30 Esplanade with wooden frontal lattice. 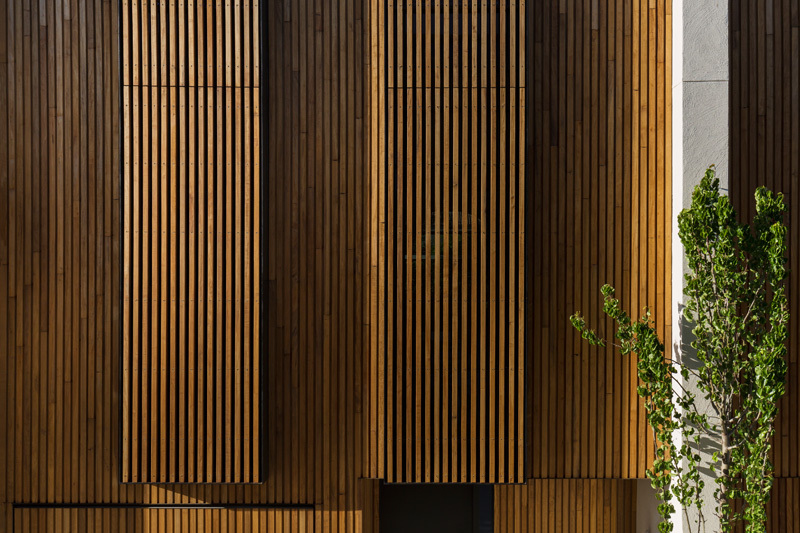 The facade of the house has wooden lattice shaped in an interesting way. It looks very unique and beautiful that anyone who would pass by would surely take a second look. When the garage door is closed, all the homes will be covered with wooden lattice. Looking really nice, right? The combination of wood and concrete is fab and sophisticated. The living room features a large wall of windows that gives a nice view of the private outdoor space with a green wall. It would be nice to see green things while inside your very own house. Notice also that there are plants used as a centerpiece. Comfy sofa and chairs are used in here. 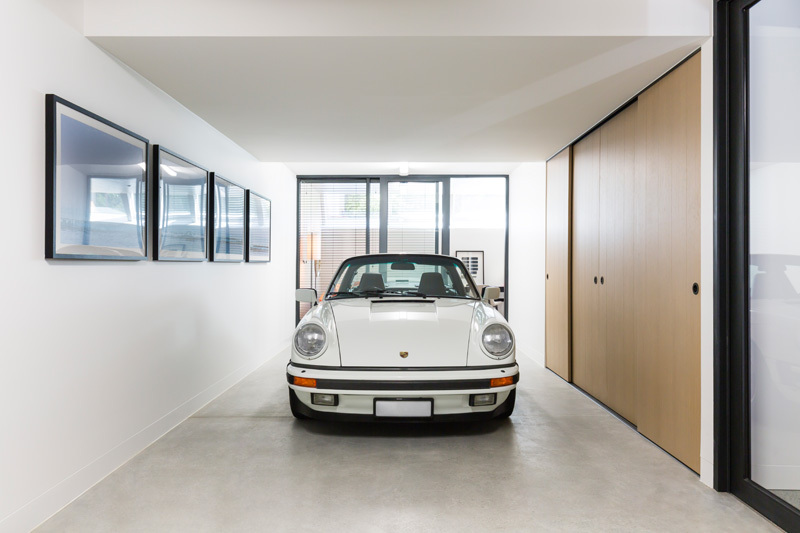 The interior of the house make use of an open floor plan that connects the living, dining and kitchen areas. 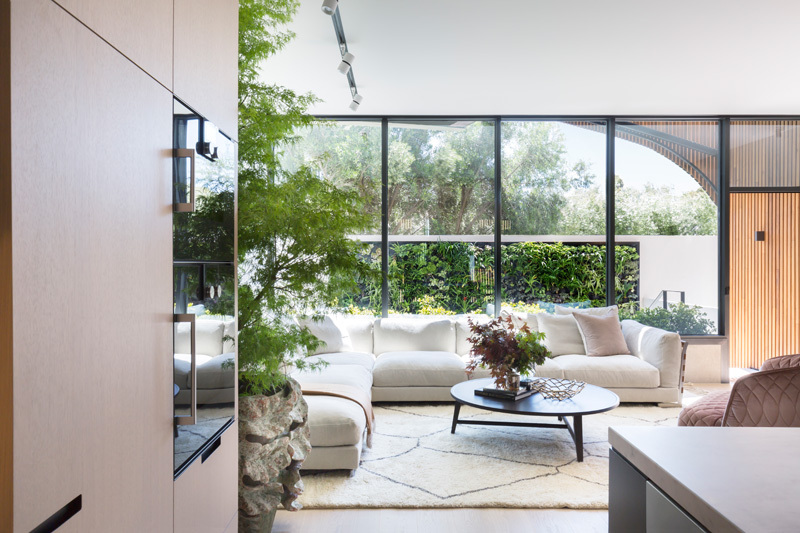 It is also a good idea that they connected the interior to the outdoor spaces by adding plants inside. That area rug brings a creative touch to the space too. 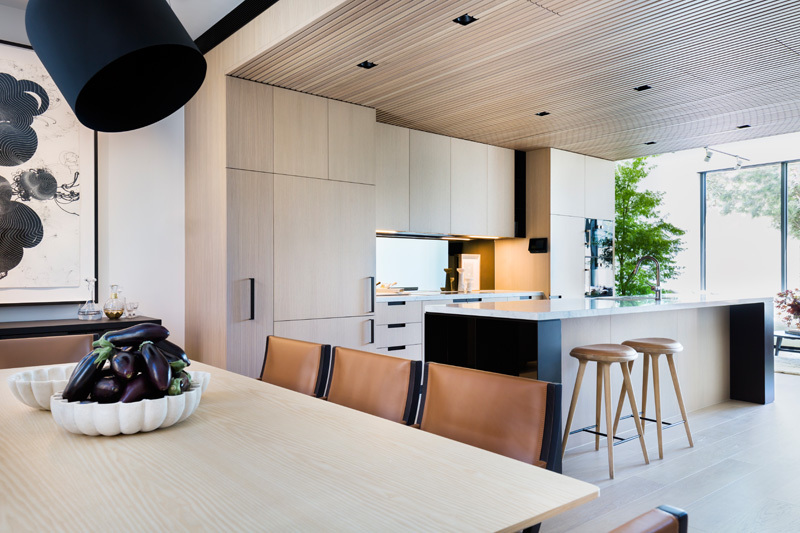 Wooden ceiling is used in the interior specifically in the kitchen which helps create a focal zone for the area. It does look good with the wooden kitchen cabinets and flooring. 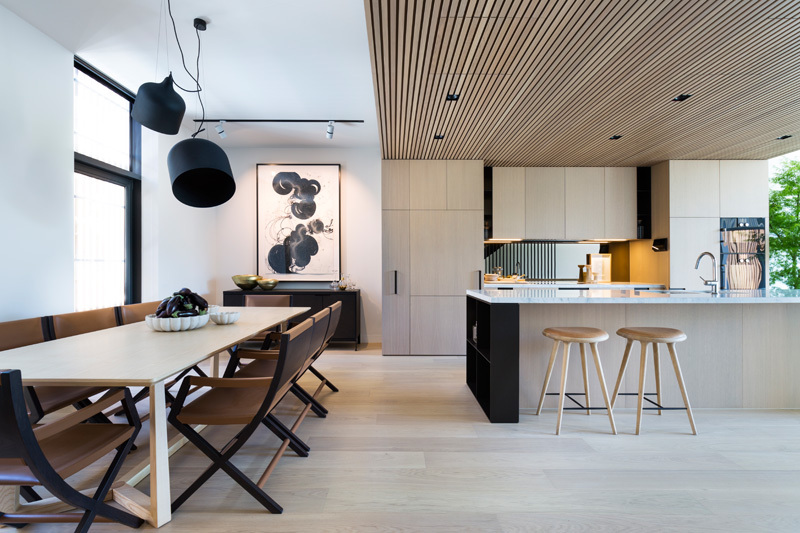 You can see that the home as a beautiful and neat set-up using contrasting tones as well wooden textures for the cabinets in the kitchen and the ceiling. There is also a counter height wooden stool for the kitchen island. You can also notice that there are wall decors that spice up the interior. The master bedroom has a simple yet attractive style that features a neutral palette. 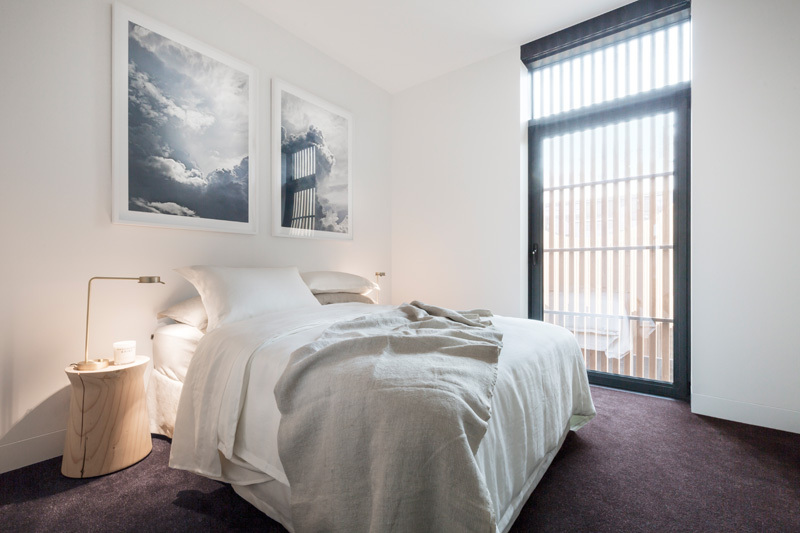 You can sense comfort and softness merely by looking at this bedroom. Notice also that it has a floor to ceiling window that is covered with a sheen curtain to block the entry of natural light. Off the master bedroom, is the master bath that has a dark contrast to the light bedroom colors. 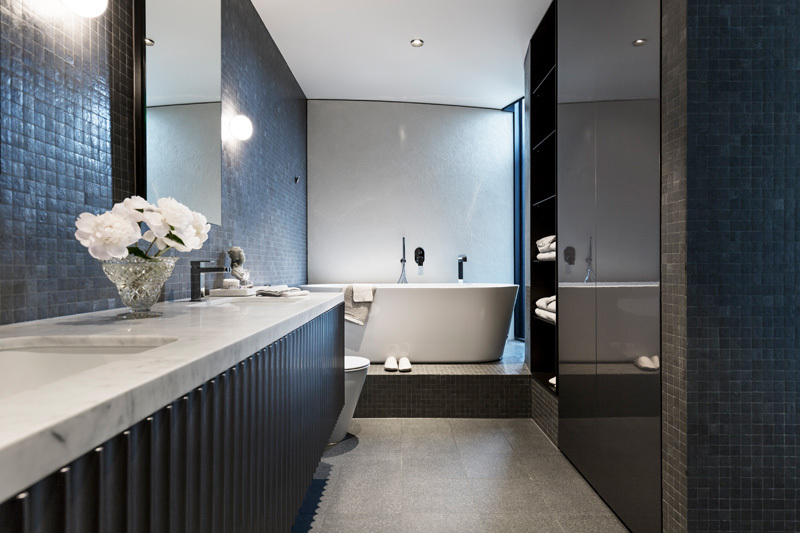 You can see that the bathroom has dark colors in it that made it appear luxurious and sophisticated. The bath tub is raised from the flooring with a tiled platform. 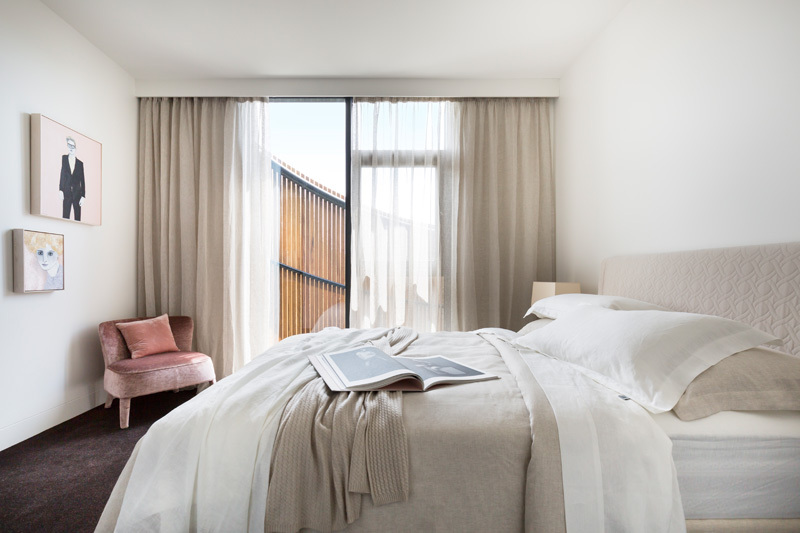 A second bedroom that is also as simple as the master bedroom, has lots of natural light from the floor to ceiling window. The wall decors add a refreshing and soothing aura to the entire space. I also like the design of that wooden side table. Another notable element of the home is a large study that features a custom wooden shelving. This is actually a good way to do away with boring walls. Put a shelving to the entire wall so you can display your collections and other favorite items. It will also be a good additional storage for books and other stuffs. When one gets inside the house from the garage, he will be welcomed in this space with an orange sofa and a working area. 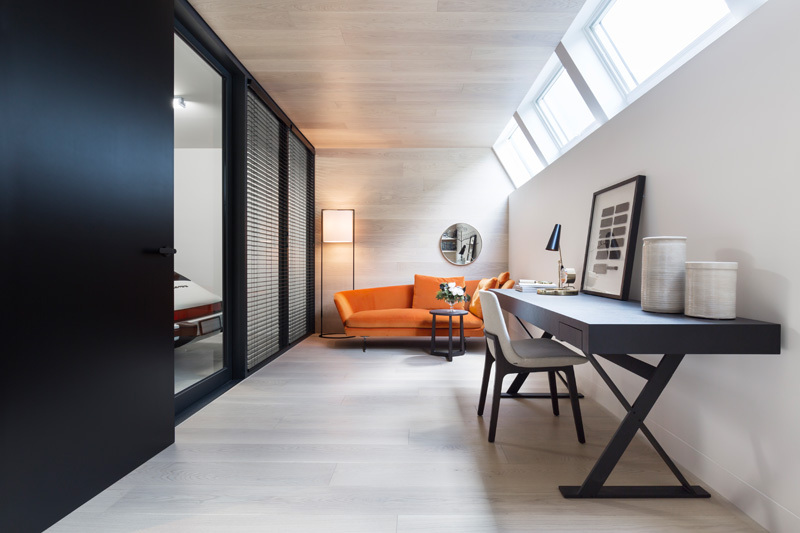 Natural light enters the space through the clerestory windows. It looks really nice to work in a quite place like this, right? Seen here is the garage with white wall colors. A sliding wooden door allows access to the interior of the house. It would indeed be nice to have a garage as neat as this. Aside from the wooden lattice, it has a white textured part that matches well with the look of the home. It actually adds more detail to the townhouses too. 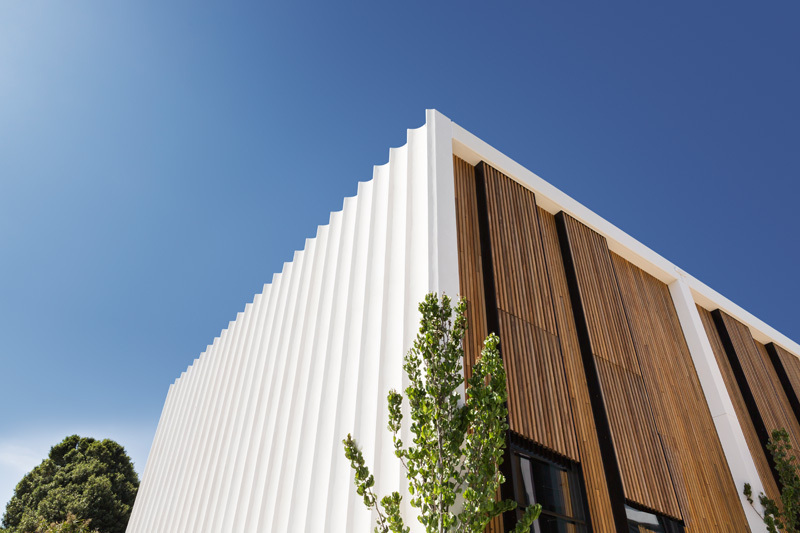 The combination of white and wood never fails even for the exterior! We have seen how this combination works in the interior but it does look amazing for the home’s exterior too. Seen here are wooden lattice designs. This is a closer look of the details of the townhouses’ facade which also adds privacy to the home since it covers the glass windows. What can you say about this house? It looks really nice indeed with the wooden lattice. I never thought that wood could appear this stunning and attractive like what Wood Marsh Architecture did to the townhouse. Aside from that, the interior also looks neat, organize and beautiful. Notice that there is a tree in the front area of the house that adds freshness to it. Plants are also seen in the interior too as well as in the small garden that offers a good view from the inside.